Natalie Jones | Greene County News Part of HALO’s team (left to right) working to make dogs deemed unadoptable become adoptable. Regina Willen (founder), Tonya Charles (volunteer and foster), and Cathy Brown (public relations director). 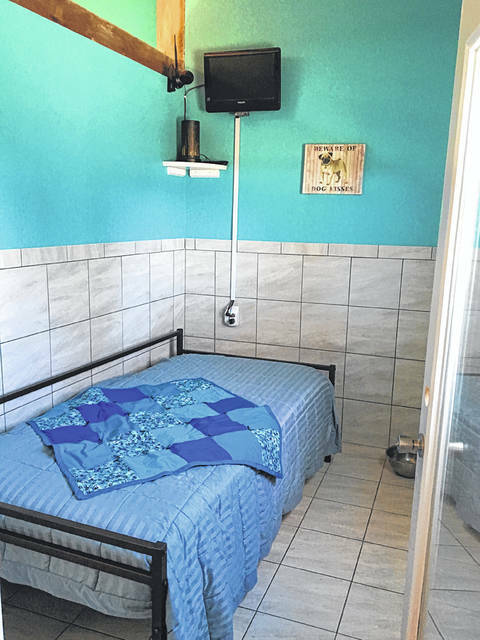 Each room contains a bed, television, lavender diffuser and window to make the dog’s environment feel like home. HALO works to create a less stress environment to help dogs with behavioral problems. - Christmas Paw-ty 12-4 p.m. Saturday, Dec. 8 at 5526 Burkhardt Road in Dayton. XENIA — Helping Animals Lost and Orphaned (HALO) of Xenia is not a rescue. HALO is a non-profit organization helping dogs deemed unadoptable become adoptable. Additionally, HALO offers boarding services and behavior training. “We want to make sure people know we are not just a rescue that you can pick up the phone and call because you want to get rid of your dog. We aren’t just going to take your dog. We are going to try to intervene,” said Regina Willen, who started HALO. Willen is a neuroscience and physiology scientist and a certified animal behaviorist and discovered her passion for helping animals at the Montgomery County Animal Resource Center. This is where she worked on her thesis project with Dr. Michael Hennessy from Wright State University. Through her thesis project, she studied the relationship between cortisol levels and stress in dogs. When dogs are in shelters, their stress level is increased leading to sky high cortisol levels Willen said. She provided practical programs for the Montgomery County Animal Resource Center to use. For example, taking the dog out of the confined area and into a makeshift living room. After 15 minutes of petting the dog, the cortisol levels were reduced. The project had an 80 percent success rate and inspired Willen to create HALO. She wanted to help dogs with behavioral issues and help dogs that were deemed unadoptable. To do this, Willen and her husband moved to the Xenia area from Cincinnati and looked for a property with additional buildings. They did not care what the house looked like on the property according to Willen. HALO has been open since January and is in its first phase — taking in shelter dogs, working with shelter dogs, boarding, and behavior training. Many local shelters reach out to Willen due to her credentials. Right now, she is keeping the dogs from the shelters and finding forever families for the dogs. Her ultimate goal is to work with the dogs and return them to the shelter. The shelter will then find their forever families. This will help alleviate some of the expenses and make sure HALO does not turn into a rescue. HALO wants to help the animal, owner and the whole community. The dogs Willen works with have barrier aggression, resource guarding issues, dog aggression, or separation anxiety, among others. The average time it takes to make a dog adoptable is three months, but some take much longer. “We really work to get them where I would trust them with my family members, my kids. If I don’t, they are not going to go anywhere,” Willen said. HALO does have dogs available for adoption. Willen guarantees the dog finds the right home and the applicant is the right fit for the dog. The second Saturday of every month, HALO is at Pet-Valu in Sugarcreek 10 a.m. to 4 p.m. with adoptable dogs. HALO is most proud of its work with a dog mom and her puppies. HALO socialized the puppies at a young age and waited to get them neutered or spayed. Now the puppies are the most social, well-behaved dogs and were potty-trained young according to Brown. “They got a good start,” said Brown. Currently, HALO is focusing on dogs that are 10-12 years old with a few medical issues, but are adoptable. Senior dogs do not do well in shelters. HALO cannot operate without donations. Willen wants to expand by adding a training room. This room can be used for dog behavior training, safety training, low income dog daycare or anything the community needs according to Willen. But, it is hard to expand because the donations are used for vet expenses, she said. Local organizations have donated food, given vouchers and discounts to HALO. HALO has three upcoming events to help raise funds. A shoe drive is currently taking place until Nov. 16 or until the truck comes to pick up the shoes. HALO needs 2,500 shoes in order to earn a $1,000 donation. Brown said they have 1,000 shoes. The shoes are given to developing countries. There are several local drop off points: Live Better Massage and Relaxation, Gypsy-Alley Boutique, Tonya’s Pampered Pets, A Cut Above Salon, Broken & Beloved Floral & Designs, Xenia Community Schools, Xenia Gazette and Devil Wind Brewing. The next event is a guest bartending event 5-9 p.m. Saturday, Dec. 1 at Devil Wind Brewing. HALO volunteers will be there in the evening to explain HALO and spread its mission. Ten percent of profits will go to HALO. The last upcoming event is a Christmas Paw-ty 12-4 p.m. Saturday, Dec. 8 at 5526 Burkhardt Road in Dayton. There will be a grand prize raffle, kid crafts, hot chocolate bar and snacks, homemade wreaths and crafts for purchase, music, free dog toenail trims by Laura’s Pet Styles and adoptable pets from HALO. HALO works “to help the animals that were lost and orphan because many of them are not only lost but surrendered to the shelters by the owners because they can’t deal with whatever the behavior problem is that they have,” Willen said. 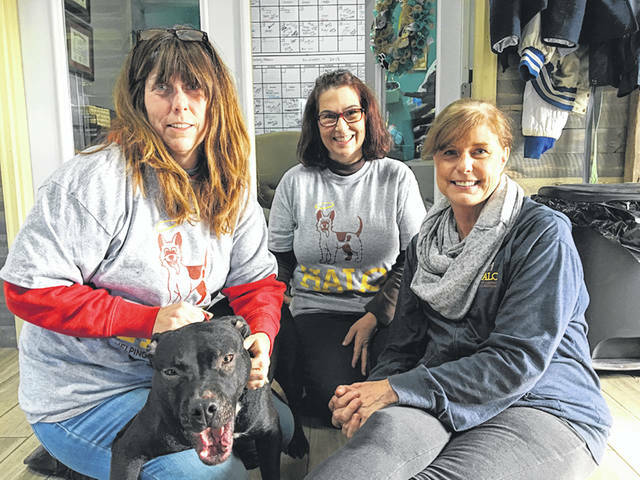 https://www.xeniagazette.com/wp-content/uploads/sites/32/2018/11/web1_Halo01.jpgNatalie Jones | Greene County News Part of HALO’s team (left to right) working to make dogs deemed unadoptable become adoptable. Regina Willen (founder), Tonya Charles (volunteer and foster), and Cathy Brown (public relations director). 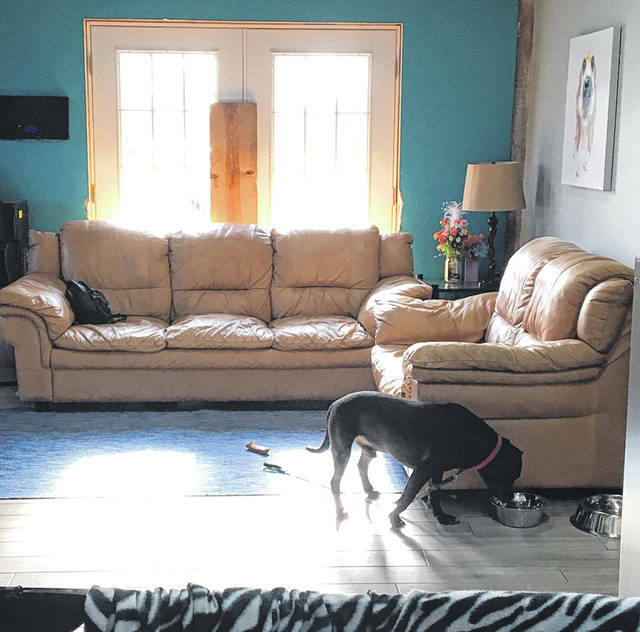 https://www.xeniagazette.com/wp-content/uploads/sites/32/2018/11/web1_Halo02.jpgEach room contains a bed, television, lavender diffuser and window to make the dog’s environment feel like home. https://www.xeniagazette.com/wp-content/uploads/sites/32/2018/11/web1_Halo03.jpgHALO works to create a less stress environment to help dogs with behavioral problems. – Christmas Paw-ty 12-4 p.m. Saturday, Dec. 8 at 5526 Burkhardt Road in Dayton.